We the People: Chaos under the Articles of Confederation to the US Constitution. This chapter follows along with the new American nation, weak and divided, as it struggles under the form of government stipulated by the Articles of Confederation, culminating in the drafting of the United States Constitution. Money of the era is described and placed in context of these historical events. The "Coins & History Chapters" button at upper right opens up other units in our US Coins & History section. The links directly below are sub headings in the "We the People" chapter. The bicentennial of the Articles of Confederation was recognized on this U.S. postage stamp in 1977. Long before the fighting in the Revolution came to an end, the Continental Congress realized some kind of unity was needed between the new independent states. The delegates responded by drafting the Articles of Confederation, adopted November 15, 1777. The Articles created a confederation, or league, of free and individual sovereign states, to be collectively called "The United States of America". It took until 1781, however, before all thirteen states ratified the Articles of Confederation. Under the terms of the Articles of Confederation, each of the thirteen states would function as a separate and self-sufficient unit, free to conduct its own local business and only bound to the others in matters of defense and foreign affairs. The Articles amounted to little more than a friendship pact amongst the new states. 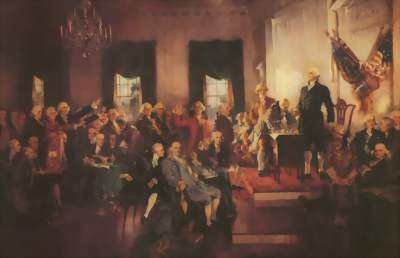 "Leaders of the Continental Congress" by Augustus Tholey. 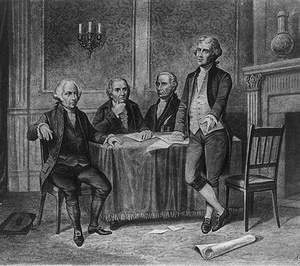 From left to right, John Adams, Robert Morris, Alexander Hamilton, and Thomas Jefferson. As weaknesses in the Articles of Confederation became apparent, serious debate began on the benefits of a stronger national government. Image courtesy of Library of Congress. Unfortunately, the Articles proved to be too weak to deal with many important problems. For instance, the infant United States Treasury was empty, yet faced a debt of $8 million to foreign countries and $32 million to American citizens. How were these obligations to be met? Certainly not through taxation, since under the Articles, Congress lacked the power to tax. It could ask the states for money, but with no means to force compliance, the states contributed very little, by no means enough to finance a properly functioning Congress. The new central government also had no authority to regulate commerce between the states and with foreign nations, and therefore, could neither levy a tariff on foreign goods, nor prevent a state from taxing goods from neighboring states. Congress had printed unsecured Continental Currency since the Revolutionary War years, but since these were virtually worthless ("Not Worth a Continental", became the grumble for anything having no redeeming value), they played no role in satisfying creditors. Consequently, the United States was unable to pay its debts for the first few years of its existence. One of the few successes under the Articles of Confederation was the Land Ordinance of 1785, establishing a uniform system of surveying and settling western lands north of the Ohio River. The Northwest Ordinance of 1787 provided for governance of the new areas. This 1790 drawing by Joseph Gilman shows Fort Harmar in the foreground. 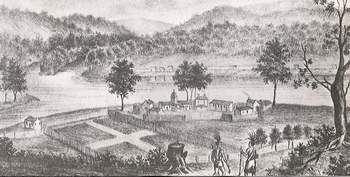 Across the river, the first organized settlement in the Northwest Territory, Marietta (Ohio), is seen. Public domain image. Moreover, there was no national court to adjudicate disputes crossing over state lines. A cumbersome method for Congress to select judges to hear such disputes was specified, but no decisions could be enforced. Nor did any court framework exist to protect the rights of individual citizens, and there was not an executive power to see to it that the laws passed of Congress were obeyed. Nonetheless, shortcomings were predictable, as there was no template for the new nation to follow. Every step along the path of self-governance was experimental. As the world watched skeptically, not many believed the Americans would enjoy their new freedom for very long. Connecticut coppers, like the 1787 specimen shown above, were produced from 1785 to 1788. The state government contracted private minters to strike the coins. The obverse legend reads ACTORI: CONNEC [by the authority of the state of Connecticut]. The reverse legend INDE: ET. LIB: means Independence and Liberty. Image courtesy of EarlyAmerican.com. The Articles of Confederation maintained that Congress had the power to regulate the alloy and value of coins struck by their own authority, or by that of the respective states. Thus, each individual state had the right to its own coinage, but only Connecticut, New Jersey, Massachusetts, Vermont (not to become a state until 1791), and New Hampshire, exercised that right. 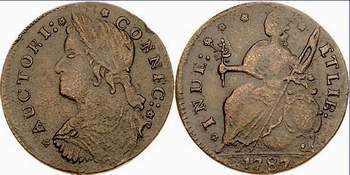 And so, during the 1780's, there was a confusing variety of these state issues circulating sparsely throughout the country, minted mostly in copper. These post-Revolution, pre-Constitution coins represent a truly unique era of American history, and are admired by all true numismatists today. Once again, the standard reference we recommend to best delve into this subject is Walter Breen's Complete Encyclopedia of U.S. and Colonial Coins. Monstrously comprehensive and richly illustrated, Breen presents great information on coinage during the Articles of Confederation years, complete with "behind the scenes" tales and estimates on relative scarcity of many of the coins. By the mid 1780's, a few prominent thinkers began to conceive of the advantages of forming a stronger central government and national identity, including the establishment of a national mint and a standardized coinage system. The money situation at the time was woefully inadequate and bewildering. Imagine for a minute that you're a Boston shopkeeper in the year 1785. A customer approaches the counter to buy some coffee. If she was lucky enough to have even a few coins, they could be of French or Spanish origin, or perhaps English, Dutch, or German. She might also have in her pocketbook coppers coined in Vermont, Connecticut, or New Jersey, or state paper currency, for that matter. She easily might have some Continental Currency, but as a shopkeeper, you would be very hesitant to accept it (unless you needed some wallpaper, and didn't care about interior decorating). Unfortunately, the Articles did nothing to bring order to such chaos. 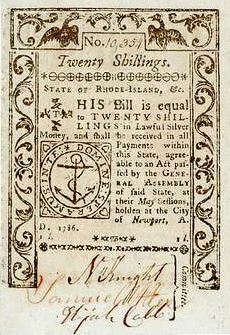 Twenty shilling note, issued by Rhode Island, 1786. The state's paper money became so shunned that a law was written to punish anyone refusing to accept it. Image courtesy of EarlyAmerican.com. To bring about some semblance of order, Thomas Jefferson recommended the use of a simpler decimal system, a radical departure from Europe's stodgy coinage structure (pence, shillings, and reales, for example). But as a sign of respect and tradition to the Old World, Jefferson further suggested the proposed decimal system be based on the dollar. Unlike the Spanish dollar, divided into eight reales (a.k.a. "bits"), the new dollar would be divided into hundredths and tenths, a system much easier to deal with mathematically. Jefferson's ideas were welcomed by many, at least superficially. On July 6, 1785, the United States Congress voted in favor of Jefferson's plan, but took no action beyond that. There simply was still not enough interest in redefining the role and responsibilities of the national government, in the realm of coinage or anything else. While undesirable, the coinage fiasco was allowed to fester for a while longer. Very soon, as we shall see beginning in the paragraph below, the political leaders were forced to deal with dangerous events, wrought in part by coinage deprivation. The fortunes of the young nation would be radically shifted in a new direction. The scarcity of coins during the Articles of Confederation years was nothing new: Americans had been plagued by this since the earliest colonial settlements. But this time, the coin dearth threatened the very existence of the newly united states. Following the Revolution, the country suffered a severe economic slump. Especially hard hit were farmers living in Massachusetts. Boston city dwellers, who disproportionately controlled the Massachusetts state legislature, passed new laws to shift a higher tax burden onto the already indebted farmers, in the hope of balancing the state's budget. The legislature could not have inflamed tempers more, even had they purposely set out to do so. In the absence of sufficient coin circulation, paper money was the only feasible option to pay taxes with, but neither side could agree on the amount of new paper money to be printed. The farmers and other debtors wanted lots of paper money printed to pay off their debts with inflated currency. Naturally, creditors wanted to hold the line on the paper money supply to keep its real value stable. By September, 1786, the conflict between creditors and debtors turned deadly. Shays' failed attempt to capture an arsenal ends in bloodshed. Although it was put down, Shays' Rebellion convinced many throughout the states that the new nation, under the weak Articles of Confederation, may not be capable of calm self-governance. Image courtesy of Library of Congress. Under the leadership of Daniel Shays, a veteran of the Revolutionary War, hundreds of frustrated Massachusetts farmers decided to take matters into their own hands. After forcibly closing courts in a few places to stall farm foreclosures, Shays and his band of insurrectionists tried to seize a government arsenal in Springfield on January 25, 1787. The state militia dispersed the group with gunfire, killing three. Shays was captured and sentenced to death for treason, but was pardoned. 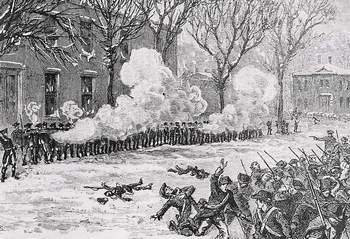 Even though the Shays' Rebellion was crushed, widespread civil unrest continued, much to the alarm of many Americans. The near anarchy revealed the weaknesses of the Articles of Confederation in governing the United States. What authority could intercede when a state uses heavy-handed tactics against its own citizens? Who is best capable of containing a breakdown of law and order? What can be done to bring order to the messy financial situation? These and other questions in the aftermath of the Shays' Rebellion provided new impetus toward strengthening the central government. Delegates from 12 states met at Independence Hall throughout the sweltering summer of 1787 to devise a document upon which all the states could become better united. Public domain image. In May, 1787, 55 of the most distinguished men in America, representing twelve states, assembled at Independence Hall in Philadelphia to begin the difficult job of transforming a "friendship league" into a unified nation. Only Rhode Island chose not to send a state contingent. By mid-June the delegation concluded that, rather than amend the existing Articles, a new governing document was the best course of action. There simply was not enough in the Articles of Confederation worth saving. Thus, the first attempt at self-governance had failed, but the young United States would be given another chance, perhaps its last, to form a more perfect union. 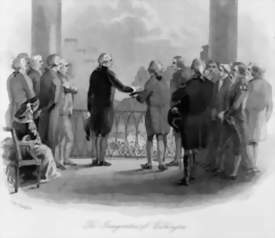 George Washington (standing), perhaps the most respected man in America, chaired the committee, a move to inspire public trust in the proceedings. It was almost universally accepted that if a new government was to be formed, Washington would be the nation's first president. Painting by 20th century artist Howard Chandler Christy. Public domain image. While the delegates generally agreed the government shaped by the Articles was too weak to ensure the survival of the United States and should be abolished, the new direction that was to replace the Articles was was indeed a highly contentious matter. The men who met at Independence Hall throughout the long hot summer of 1787 debated fiercely in drafting a document that was to constitute a wholly different form of government. The majority of the delegates voiced their opinion to strengthen the national government, while acknowledging that the liberties of the people would be jeopardized if too much power were granted to the government. At the same time, the delegates believed that the people's power should not go unchecked, for fear that a majority could tyrannize a minority. They recognized that a way to prevent any group from becoming too dominant was to balance the interests of each group against those of the other groups. With these basic principles serving as the guiding light, debate forged ahead. Benjamin Franklin, at age 81, helped fashion a compromise between the small and large states, at a time when it was feared the impasse would doom the negotiations. Ever the optimist, at the conclusion of the Constitutional Convention, Franklin pointed to the chair where Washington had sat as presiding officer. On the back of the chair was the painting of a sun. Franklin said, "I have often in the course of the session... looked at that sun without being able to tell whether it was rising or setting; but now I have happiness to know that it is a rising and not a setting sun." 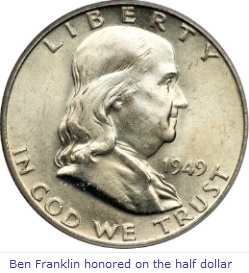 As one of the greatest Founding Fathers, Franklin was honored by being placed on the half dollar from 1948-63. His portrait still adorns the $100 bill. Coin Photo courtesy of Ira & Larry Goldberg Coins & Collectibles, Inc., Beverly Hills, CA. On September 17, 1787, all but three of the remaining 42 delegates signed their approval for the new Constitution. In accordance with their belief in balancing competing interests against one another, the delegates separated the national government's power into three branches: The Executive [the Presidency], The Legislature [the House and Senate], and The Judiciary [the courts]. A division of powers was also provided for between the federal government and the states, both possessing important areas of authority. Furthermore, the federal government was granted the muscle to tax and regulate commerce, to handle international affairs, and the responsibility to provide for a national defense. Article I, Sec. 8 enumerates Congressional powers, including the power "To coin money, regulate the value thereof, and of foreign coin...". This gave Congress control over the minting of coinage and how much the coins shall be worth and the clout to set the value of foreign coins circulating in the United States. Finally, the new Constitution specified an amendment process, thereby guaranteeing future generations of Americans could revise the document to meet the changing conditions of their own times. WE THE PEOPLE...the first three words of the Constitution conveyed to a worldwide audience that in the newly created United States, ultimate governmental power will be derived from the consent of the people. 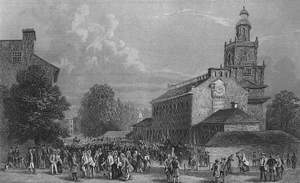 Image courtesy of National Archives. To indicate that the new federal government would be a republic of Americans rather than just another confederation of states, Pennsylvania delegate Gouverneur Morris rewrote the Constitution's Preamble with heart-stirring resolve: "We the People of the United States, in order to form a more perfect Union, establish Justice, insure domestic Tranquility, provide for the common defence, promote the general Welfare, and secure the Blessings of Liberty to ourselves and our Posterity, do ordain and establish this Constitution for the United States of America." The Constitution was sent to the Congress (still assembling under the auspices of the Articles of Confederation), which in turn quickly sent it directly to special ratifying conventions in the states for approval, purposely circumventing the legislative bodies of the states. Many of the state governments were dominated by individuals who would not be willing to relinquish any powers at all, it was feared. Nine of thirteen states had to approve the Constitution for it to go into effect. The Inauguration of George Washington, April 30, 1789, standing on the porch of Federal Hall on Wall Street in New York City, the first capital city of the United States. As the final words of the oath were spoken, the crowd erupted in cheers. From an engraving by J. Rogers. Image courtesy of Library of Congress. On June 21, 1788, New Hampshire became the ninth state to vote in favor of the proposal, and the Constitution was officially adopted. Elections were held in January, 1789. The following April, to no one's surprise, the first electoral college unanimously voted George Washington as president, with John Adams chosen as vice president. Shortly thereafter, the 1st Congress was seated. In an age ruled by monarchs and tyrants, the United States was about to institute a type of representative government, based upon the consent of the governed. The Constitution was a remarkable document, granting power from the people to elected officials, an experiment in ordered liberty that has faced the test of time. 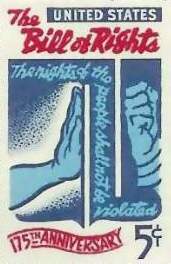 This 1966 postage stamp celebrates the 175th anniversary of the Bill of Rights. The hand on the left, representing the people, holds firm against the gloved fist of oppressive government, thanks to the protection afforded by the Bill of Rights. 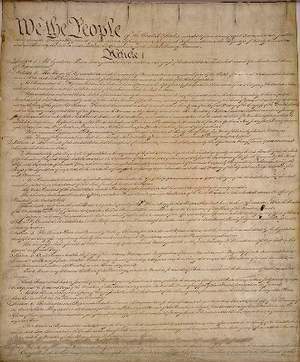 Despite the many individual liberty safeguards written into the Constitution, some states would not ratify the document until they were assured that a bill of rights, that is, a system of laws protecting individuals against a potentially overbearing federal government, would be added to the Constitution as the primary order of business of the 1st Congress. As promised, the Congress quickly began drafting a list of proposed amendments to the Constitution, to guarantee that the rights of a person could not be suppressed by the power of government. In September 1789, Congress voted in favor of twelve amendments to the Constitution and sent them to the states for approval. Two of them (addressing congressional salaries and redistricting) did not survive the states' scrutiny, but the remaining ten were ratified and were incorporated into the Constitution in 1791. The first ten amendments to the Constitution became popularly known as the Bill of Rights. The first eight amendments in the Bill of Rights deal with personal freedom, property rights, and fair treatment under the law. Amongst some of the guarantees enumerated are freedom of religion, freedom of speech, and freedom of the press. The right of the people to peacefully assemble, the right to petition government to correct wrongs, and the right to keep and bear arms, are also precious liberties protected by the Bill of Rights. James Madison, known as the "Father of the Constitution" was also instrumental in drafting the Bill of Rights. 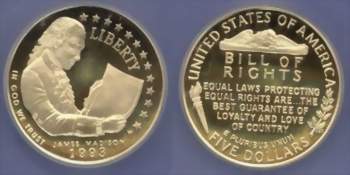 This five dollar gold commemorative coin , issued in 1993, honors Madison for his contributions. As a further restraint against the police power of the state, the Bill of Rights requires authorities to obtain a judge's warrant before searching or confiscating any private property, and prohibits "cruel and unusual punishment". Individuals accused of crimes are to receive a fair trial by jury and cannot be forced to testify against themselves. The Ninth and Tenth amendments limit the powers of the United States government to those specified in the Constitution. All other powers are reserved to the states and to the people. From the time of its ratification, the Bill of Rights became one of the most cherished fabrics of American society. The American people proudly consider it to be the trademark of our brand of freedom. Globally, it has been the beacon of light that brought millions to our shores in search of self-determination. In the United States, for example, if a person stands on a street corner and criticizes government policy, the Bill of Rights guarantees that person his right to free speech. Contrast this to many other countries in the world, where anyone caught speaking ill of political leaders would be thrown in prison, or worse yet, face a firing squad. No wonder so many are willing to literally risk their lives to reside under our Constitution and Bill of Rights. For those of us who respect the accomplishments of the Framers in writing our founding documents, David L. Hudson's The Bill of Rights: The First Ten Amendments to the Constitution provides a terrific explanation of the full meaning of each amendment in the Bill of Rights. Hudson goes into some detail (but not too much) into the thinking of the Founding Fathers as the Bill of Rights were being drafted, and relates how this is all important in our world today, through the use of highly illustrative examples. The book is written at a 6th grade level, but since Hudson's enthusiastic approach makes it hard to put the book down, it is a great inspiration for readers of all ages. When finished reading this book, you will feel a deeper sense of appreciation for the wisdom of the Founders, and a better understanding how individual liberties and rights have made this the greatest nation in the history of mankind. 4 Breen, Walter. Complete Encyclopedia of U.S. and Colonial Coins.